Winter cold has arrived, and for many adventure travelers this is the time to relax with a cup of tea, a cozy blanket and an exciting movie. I love seeing familiar places on screen and there is nothing more quintessential to American films as the canyon regions of Utah and Arizona. These unique and arresting landscapes have long captured the imagination of filmmakers and artists. 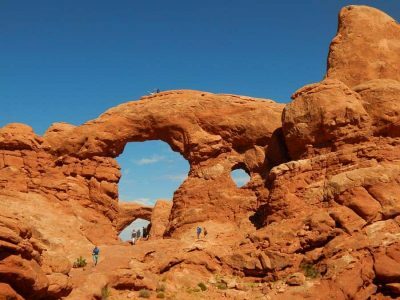 These scenic, other-worldly locations have provided the backdrop for classic Westerns, and more recently a wide range of science fiction films. John Ford directed many classics with John Wayne in Monument Valley, Charleton Heston climbs out of Lake Powell into a strange desert world in Planet of the Apes, The Hulk is pursued through Page and Lake Powell for a showdown in Arches National Park, the Joad’s over-packed car trundles through the Petrified Forest, and even Dr. Who makes an appearance in Mexican Hat and Lake Powell. In these films you can view the expansive vistas of the canyon region from the comfort of your own couch. And of course, if you’re interested in stepping away from the screen and into a real-life adventure, we offer a range of great small group tours throughout this region! There are many great documentaries about the American west, showing the splendor of National Parks while demonstrating the importance of conservation. This is a wonderful mini-series, filmed over the course of six years throughout some of the most famous National Parks. The documentary accurately portrays the splendor of parks while sharing the unique history of conservation efforts. Taking viewers from Yellowstone, the world’s first National Park, through nearly 150 years of varied US park history, the New York Times called this documentary an “unabashed love letter, with its backdrop of spectacular vistas filmed in 52 national parks”, and it won producer Ken Burns an Emmy in 2010. 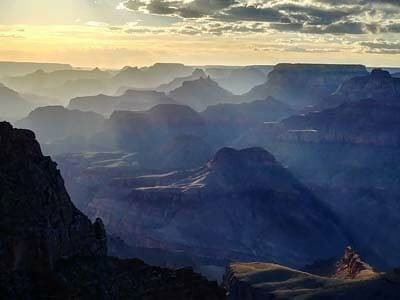 What to Look For: The whole series is fantastic, but the creation of Grand Canyon National Park is captured in episode 2 “The Last Refuge” and not to be missed. What to look for: Although the story takes place along an imaginary route between Arkansas and the Grand Canyon, it was mostly filmed in California around Los Angeles and Bakersfield, and in Utah, including Moab, Monument Valley and Arches National Park. 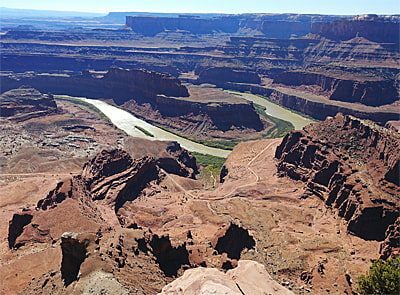 The iconic ending scene was filmed at Dead Horse Point State Park. Something you might not know: George Clooney was on the short list for the part of J.D., a drifter and criminal with who Thelma has a brief affair with, however the part was eventually awarded to a little-known actor named Brad Pitt, who was paid $6000 for the role. The film launched his career. Unerringly kind and sensible in his simple way, Forrest Gump (Tom Hanks) wanders through the most important events and trends of the second half of 20th century America. The movie is full of classic images of this turbulent and idealistic period, as Forrest dances with Elvis Presley, wanders into historic desegregation of the University of Alabama, serves in Vietnam, and attends a peace rally, and accidentally exposes Richard Nixon’s wiretapping. What to look for: Brokenhearted Forrest goes for a “little run” that lasts over 3 years crisscrossing the nation. 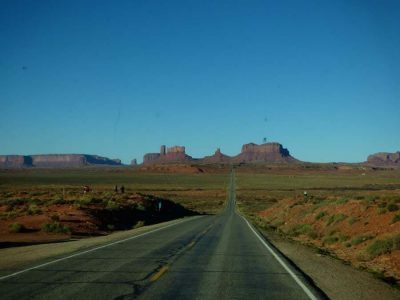 It’s on highway 163 through the Monument Valley Tribal Park where Forrest Gump finally stops running. The third Indiana Jones film, produced by Steven Spielberg in 1989 and featuring actors Harrison Ford and Sean Connery, focuses on the origin of the famous archaeologist and treasure hunter, whose story continues in this fast-paced adventure. This film is a little more goofy and lighthearted than the previous films in the franchise and centers on a whirlwind plot that includes a search for both the Holy Grail and Indian Jones’ missing father. 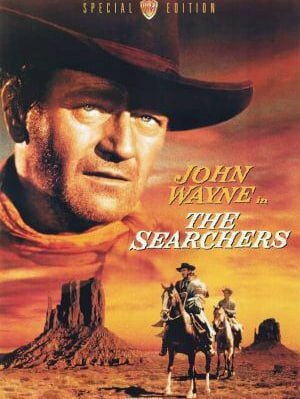 What to look for: Early in the film, young Indiana Jones deserts his boy scout troupe to chase robbers through Arches National Park. The Double Arch is immediately recognizable. Something you may not know: An enormous amount of time and money went into creating special effects for this film, included a mechanical rhinoceros and full-size fighter planes. Much of the filming was done in exotic locations to provide realistic and fantastic backdrops. Even though so much effort went into creating an incredible movie experience simple household objects were also used to produce sound effects, including a Styrofoam cup rubbed to mimic the sound of fire, used as Indiana is fleeing a German castle. I hope you enjoy this film selection. If you want to step away from the screen and into these incredible landscapes with a small group tour, check out our Canyon Lands Tour, the longer Western Wonderland or the appropriately named Winter Wonderland, all of which highlight the best of the region on real-life adventures that are better than any movie. Are you ready to watch? All of these films are available to stream from Amazon Prime, Forrest Gump and Indiana Jones and The Last Crusade are both available on Netflix. You can also stream National Parks Americas best idea on PBS.